2 bedrooms, 1 full bathroom, sleeps 4. Direct ocean front single family home with it's own beach! 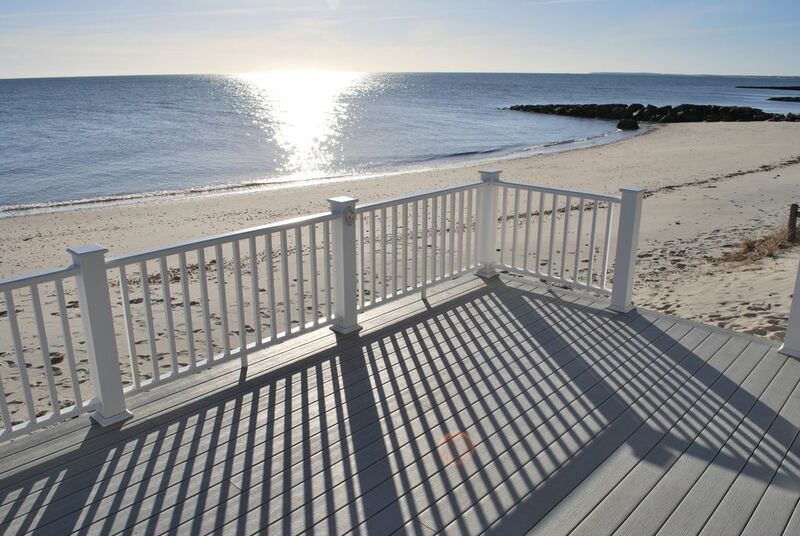 A few steps down from the new in May 2015, composite 19'x13' deck; to your own sandy beach on the Nantucket Sound! The panoramic ocean view is incredible 24/7. The sunrises and sunsets are absolutely breathtaking. All rooms of the home have ocean views and the views from the deck are simply fabulous. This home was thoughtfully renovated during 2004. The home has Wireless Internet, a gas fireplace, Samsung 46" HD LCD TV in the living room, with a new Samsung DVD/Blue Ray player. Samsung HD LCD TV in master bedroom with a Samsung DVD player, Sony CD/radio in the kitchen, microwave, A/C in living room, full size electric range/oven, large refrigerator, enclosed outside shower. All amenities in the house are new & quality, including the entire kitchen, bathroom, flooring, beds, furniture and appliances, etc. This home is in excellent condition, very well maintained and is kept neat and clean. This wonderful beach home in a great location on Mid Cape can be yours for a very memorable Cape Cod stay! We bought this house from a gentleman who had it in his family for about 50 years. They had taken very good care of it and Dennis is a wonderful Mid Cape town. From the day I first drove by the property and then walked through the front door for the very first time and saw the ocean and the setting of the house on the beach - had to have it! 250 square foot Trex deck. You can't get any closer! If you are looking for beachfront this is as close as you can get. Very cozy home, we loved it! Although the bath and bedrooms are a little small overall the home was just what we were looking for. There were a couple of things like the fireplace not working (the repairman came) and the kitchen faucet had a constant drip, no kayak, and no closure to the outside shower, but the quality of the amenities in the home were very good. The beds were comfortable, the kitchen was well equipped, and the deck was beautiful. We would definitely rent this home again and I would highly recommend it to anyone looking for beachfront. Thank you for coming to visit Cape Cod and staying at our home! We are for sure close to the ocean and our little one loves being able to get out on the beach so quickly and easily when we are here, as we do too! Please feel free to come back to our house when you are coming to visit the Cape again! Incredible week on the beach! Everything about this place was perfect. We were a bit skeptical of the size but it was great. Beautiful views and an incredible location. We particularly loved wolfies for coffee and muffins. Other than a washer and dryer we had everything we needed. Our entire family feels the exact same way you do about our very special Cape Cod place! When our family and friends are at the house; Wolfie's is one of our favorite places too. Thank you for staying at our house, we welcome you back on your next trip to Cape Cod! Fabulous beach front vacation! Adorable house that is cozy, clean and beautiful ocean views! Our family is very happy to hear you enjoyed your stay at our ocean house while visiting Cape Cod! We hope you make it back to visit us. Great spot, and a great house! Year two renting this property. Once again we had a blast. The house, the beach, the location, and the water are the best!! We are glad to hear of your return trip to The Cape and your enjoyment while at our house. Thank you! * Sailing Cow restaurant is in short walking distance and has great Nitro Cold Brew coffee in the morning. They also had a breakfast special during the week that made it a great place to grab a bite in the morning. * There are a ton of fantastic restaurants very close to the house - so if you're not interested in going very far you're in luck! * There is a farm stand and convenient store close as well. Stop and Shop is less than 15 minutes away if you plan on doing a shopping run when you get there. * There aren't any beach chairs at the house so if you enjoy sitting on the beach you should bring your own. * There are a few sand toys laying around but if you have kids that are into building things in the sand you should bring your own. * The umbrella for the deck works until there's a breeze - then it seems to just folds inside out. A nice strong umbrella would be a bonus. Also nicer deck chairs would be a plus as well but the ones there do the job. * The entertainment system and WiFi was awesome - we unplugged during the day but loved winding down with some TV and Internet. * The AC is in the main living area only. With the AC and TV on at the same time we kept tripping the breaker every time the refrigerator turned on. Luckily the breeze was constant and we only really wanted to use the AC one day. * With the windows open the relative humidity and temperature in the house is about 80%/80 degrees. The breeze was amazing so it wasn't a huge issue for us - but I could see how it could be an issue if it was very hot out. * The bathroom is cramped and the bedrooms are small but functional. We spent most of our time outside so it wasn't an issue! * There are a lot of places to hang things but not a ton of places to store it all. We just hid it behind some of the living room furniture. * The living room furniture is much more comfortable than it looks. * The grill is charcoal so it's kind of a pain to use. We like to cook out on vacation to save some money but didn't do it as much as we normally would. * Very much a Cape Cod beach house feel with the floor and ceiling wood. Nice decor! Overall this place is amazing. Enjoy! Thank you Eric for your review! We are glad you really enjoyed your stay. We loved the cape cod charm of this water front cottage.it was a perfect location! Warm and cozy feel! It was a perfect family vacation especially with the private beach! Lots of restaurants within walking distance! Clean and comfortable! Thanks so much for sharing your home with us! Hope to rent same weeks next year! We are very happy you thoroughly enjoyed your stay at our house while on Cape Cod! Lovely BEACHFRONT vacation cottage located on Nantucket Sound! The home offers a very relaxing environment for you to enjoy Cape Cod at it's very best. 2 bedrooms, 1 bath, kitchen, livingroom with fireplace, air conditioner, internet access, wonderful ocean views and spacious deck with few steps onto sandy beach. This rental is a Saturday to Saturday rental only.